02/1/16 Goodwill $1.99. Essay by Stephanie Haun. The Write Launch. The Friday rush hour traffic in a small town is just as hectic as the traffic in larger cities. Many workers get their paychecks on Thursdays, but fail to make it to the bank before the close of business, so deposits have to wait until Friday afternoon. The workers getting paid on Friday also rush around to get financial business accomplished before 6 p.m., since many of the banks lengthen their hours from the typical 4 p.m. closing time. While the banks are located in various parts of town, there are few different routes to take to get to them, which causes traffic congestion along the main roads and highways that run through the town. Sitting at a red light on one such Friday, I decided to vary my typical start of the weekend routine. That routine consists of going straight home because my patience has typically worn thin from the workweek, or I will go shopping out of town. This particular routine variance was highly unusual. I was en route to my bean bag chair to binge-watch episodes of American Dad and just escape life for a little while. Until I thought about when I had actually checked the racks of Goodwill last. By the time the light changed, I had decided that I would peruse the racks of the local Goodwill store. I shop there on occasion, looking for odd pieces of clothing or fabric that I can repurpose into some garment to wear to work. My usual finds are men’s dress shirts that I cut down and sew into a peasant blouse for myself, or my personal favorite things: sheets. I love buying interesting patterned sheets to cut into skirt panels for longer, flowing cotton skirts. Kid sheets are my favorites. Comic book character sheets, vintage television show themed sheets like Star Trek from the 1970s, Saturday morning cartoon sheets, even sports team sheets. Solid colored sheets are welcomed to break up the wildness of the themed sheets. These skirts are typically my everyday skirts for spring, summer, and early fall, but on occasion, I can sneak in a themed skirt for my workday, all depending on the flamboyance of the skirt style and/or my schedule. Teaching public high school these days can be monotonous, and finding common ground with students is really the key to capturing their interests, no matter the subject area. My common ground with my students involves all the things that weren’t considered cool to “geek out” over when I was their age. Superheroes, comic books, role playing games (rpg), Star Wars, and any other variety of proclaimed geekdom were now common ground for everyone, not just a specific clique. As one student put it, “It’s a great time to be a nerd,” and I wholeheartedly agreed. This common ground ventures into my lessons. The state may tell me what I have to teach, but they never said which path to take to get there. So, I take the creative one, and my students thank me for it. Navigating through traffic, I realized that altering my routine had a profound effect on my mood. While the day was a nice spring-like day, sunshine and clear skies, it was still winter, and the sun would still be setting early. The cold would be returning after nightfall, but for a brief couple of hours left in the daylight, my outlook on the day was looking up. I was excited about making new and fun clothes to wear, and all the possibilities that lay behind the automatic door of the former pharmacy. That was the best thing about shopping at this particular Goodwill. Although the storefront had changed, and the old business had changed and later moved to a new location, I still had the fond memories of going to the drugstore with my parents to pick up prescriptions. Candy was usually involved, or the odd toy (paddle balls and silly putty were my favorites). Even now, as an adult, I have never left this specific Goodwill empty-handed. I always find something special there, even if that “something” wasn’t what I had gone in the store to look for in the first place. An amazing thing about Goodwill stores, and other thrift shops, is the fact that the idea behind, “one man’s trash is another man’s treasure,” is quite prevalent, and Mama Gump’s advice on life is equally important— “you never know what you’re gonna get.” On this Goodwill journey, Mama Gump was right. I didn’t know what I was going to get. The strip mall parking lot was crowded. It was Friday after all. People were taking advantage of a February spring day, and payday. Finding a parking space near the store was near impossible, but the walk through the parking lot was a welcome change of pace, until the realization hit that the parking lot was just as busy as the road. I spent my walk from my car dodging cars driven by people who appeared to be on the losing end of a timed mission, and avoiding the oblivious customers emerging to the parking lot from within the various stores in the shopping center, I finally reached the sidewalk. Even with the excitement of finding potential treasures, I was not sure my patience with this excursion would stay intact for the entire shopping experience. Frustratedly dodging the crowd on the sidewalk, I was almost certain my patience would not hold out, and that I should probably abort this treasure expedition before my temper got the best of me and causing me to give up on my quest, but staying the course, I reached the door to Goodwill. I could see the treasure caches through the automatic glass doors. Sights of the gaudy costume jewelry in the jewelry cases amongst the more elegant real pieces greeted the shoppers before the doors slide open. Once shoppers pass through the doors, the old, dank smells of basements, plastic storage bags and containers, strong perfumes, and pipe tobacco greet the unsuspecting customers. Smells have the ability to unlock our memories to bring back our associations with people, places, and things. Smells are sentimental. Not every thrift store has a musty, mothball smell. If you really pay close attention to the different smells, you can learn a lot about the homes the items came from. You can learn about the previous owners. You can tell if the owners were smokers or non-smokers, if they preferred to store their clothes and linens in regular closets or cedar chests, if the house was moist or damp, or if they preferred a particular kind of laundry detergent or fabric softener or even a specific kind of dryer sheets. After years, these scents soak into the fabrics until they become part of the item. Even after the owners decide the item is no longer needed, or wanted anymore, the smell remains. Throughout multiple washings in new detergent, the set-in smells tend to linger. Just a hint of a previous life that’s not perceptible to others who did not smell the original scent remains. To me, the smells found in thrift stores are comforting. Many times, if I concentrate beyond the stale or musty odors of the clothing, I can smell other scents. My favorite scent to find is cedar. Cedar reminds me of my grandfather and my great-uncle. My grandfather was a carpenter by trade. He built furniture, including my bedroom furniture, various bookcases and my cedar hope chest. My great-uncle taught me the fine art of whittling when I was a kid. To whittle, you needed a sharp knife, and a stick of cedar. There really isn’t much rhyme or reason to whittle, other than to pass the time, and spend time in reflection of visiting with other fellow whittlers. In hindsight, it isn’t different from women’s knitting or sewing circles. The cedar shavings are just as useful as any garment made by a knitting group. My great-uncle saved all of the shavings from his whittling to give to anyone who may have needed them to line doghouses in the winter, or to women for sachets for their chests of drawers. I am always reminded of my family when I walk into the local Goodwill. Once I get over the smells after coming through the automatic doors, I am greeted by all the sights of treasures and memories. Some of the clothes on the clothing racks are most decidedly old. The styles are from the 60s and 70s, and weren’t about to come back around again. In past journeys to Goodwill, I have seen some of the exact same clothes that my grandfather had worn, and even if the clothing styles were from the 70s, my grandfather was one to still wear them because, as he said, “Nothing ever goes out of style when you’re a stylish man like me.” Maybe that’s where I get my sense of style from, as in another phrase I’ve heard throughout my life, “If it fits, and isn’t threadbare, then you wear it until it can wear no more.” I tend to take liberties with that one. I do purchase new clothes from department stores for various reasons, but for the most part, my “new” clothes are actually made from clothes that have been donated to Goodwill. Many times, the clothes at Goodwill are still quite functional, and in most cases they were donated because they no longer fit their previous owners, or they came as part of the leftover belongings from an estate sale. I try not to dwell on the possible macabre origin stories of the clothes or sheets I purchase from thrift shops, and I wash them as I would any other clothing purchase from any other store. Looking around Goodwill, I realized there had been a reorganization, and now all the clothing and linens were at the front of the store instead of in the middle, near the back. The racks were closer together than they had been previously, which made my scavenging a bit easier since I could look at two racks of clothes at the same time, checking the textures of the fabrics. Going back to the philosophy of never knowing what you’ll get, I wandered every aisle, looking over almost every article of clothing. Using my imagination, and not thinking like a seamstress, is my favorite part of these expeditions to the thrift shops. Sure, I have sewing patterns I have made from new peasant blouses bought in the department stores to use in repurposing men’s dress shirts, and I have Simplicity and Butterick patterns I have purchased to use as a guideline for a specific cut of skirts, unless I am going for the full hippie skirt look, and then I just make up my own panel patterns out of old newspapers, or plastic party tablecloths. But as for the seamstress rules (you know, things like, “this fabric can only be used for this type of garment, or you can’t mix two different types of fabric in the same garment”) my mother and grandmother imposed on me, those rules are meant to be broken. My clothes are for comfort, function, and most importantly fun. Why does it matter if the fabrics are funky or mismatched? I moved through the racks of clothing twice before I decided the effort would not yield anything from this trip, and then I moved to the linens hanging along the wall. Once again, I came up empty-handed. This little Friday afternoon side trip, which began out of listlessness turned to excitement, had turned out to be a bust. On my way out of the store, the housewares section caught my eye. For some reason, I had never looked through the aisles of kitchenware and decorative items. Goodwill trips were always for clothing purposes. I had small appliances, I had pots, pans, and dishes. All of those things had been carefully selected for me by my mother, my grandmother, and me. I looked for style more than function, and their combined years of domestic wisdom was more of a “wish list” of things they never had that would have made their cooking lives easier. Thanks to their careful thoughts on housewares, I never had a necessity to visit that section of Goodwill. I had already spent forty-five minutes roaming through the linens and clothes, so why not spend another five? I strolled past the furniture, this time dodging children, and then found four aisles of housewares in the back of the store. I saw various “As Seen on TV” appliances that I had seen on infomercials over the years, and then I came across something I had never seen before. I had heard of craft beer home brewing kits, and I have even had beer made from those kits (not a fan, by the way), but I had never seen a home root beer kit. I am not even sure how that thing worked, or if all the parts were still there. The picture on the box was not very helpful, either. There were only pictures of two mugs and a pitcher, all filled with root beer. The box itself looked like it was made of wood grain panels. Once I finished that aisle, I really did plan on going up the next aisle and straight to the doors. But as I rounded the end cap, I noticed that I was getting into dinnerware and then I saw it. I never would have imagined that I would be captivated by a 7 ¾ inch salad plate, but I was. There was something strange about the plate, although I did recognize the color and pattern. I kept on walking and looking at the shelves of dishes and serving platters and bowls. I reached the end of the aisle and instead of continuing to walk to the door, I didn’t. Then it hit me. I knew what was different about this plate. It was alone. Completely alone. All the other dishes were parts of sets, and priced as part of a set. This little plate was the only one, and the price tag did not help its loneliness situation. $1.99. A single salad plate priced at $1.99. There were “sets” of other dishes beginning at $3, depending on how many pieces were actually in the proposed set. There is an odd thing about this Goodwill. After looking a bit closer, I noticed that it didn’t matter if there were two pieces, or five pieces, or six pieces. If it matched, it was priced as a set. This included drink ware. If the glasses matched the plates or bowls, it was put on the shelf with the dinnerware and priced as a set. The 1” square, yellow Goodwill price sticker gave away a bit of information. The plate was passed through the distribution center for sale on February 1, 2016, or as was on the sticker, 02/1 /16. Yes, with the 1 in the wrong place in the date. Beneath the GOODWILL label on the sticker was the price, $1.99. 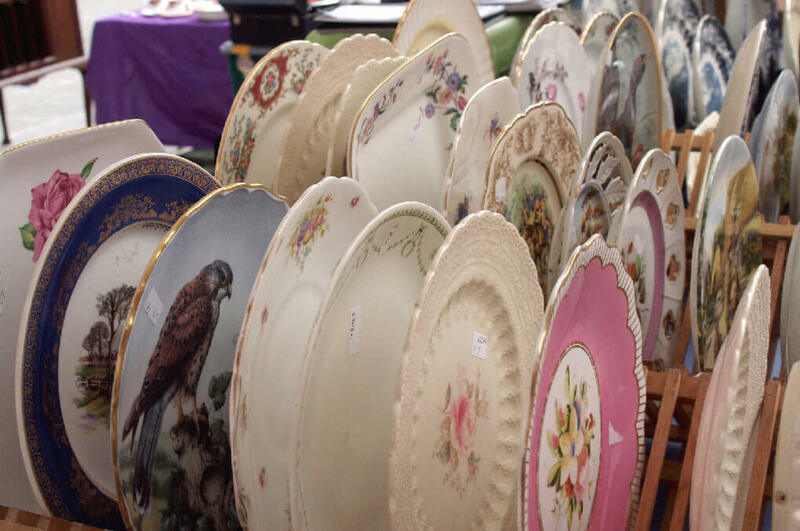 Why would a single, solitary plate be priced for almost as much as a set of dinnerware? The age of the plate may have been a factor in that pricing decision, since the plate itself had definitely seen better days—the lip around the edge was lightly chipped and discolored, the pattern color had faded over the years and some of the pattern color had just turned from gold to gold with black patches, and the overall lack of care it had seen was unlike the other plates I had seen like it in my lifetime. The plate was a Corelle plate from the 1970s. My entire home dining experiences have occurred on this very brand of dinnerware. My mother owns a set of Blue Garland Snowflake Corelle dishes, and my grandmother owns another set of a different pattern, Spring Blossom, which is a collection of flowers in avocado green. My mother’s sister has the Woodland Brown and White pattern (just outlines of grass, twigs, and wildflowers in brown), and my great-aunt, the whittler’s wife, was the proud owner of the same pattern as this lonely plate, Butterfly Gold, which was a pattern of flowers and butterflies in a harvest gold yellow, circling the edge of the plate. In looking at the plate on the shelf of the local Goodwill, and I recognized how my simple and happy childhood activities with my grandmother and her sister really solidified how I would grow into adulthood. After all the years of dining on the same dishes, with the same glasses, and with the same silverware, I was taught a few lessons. “If it isn’t broken, why does it need to be fixed?” “Always try to leave people and things better than when you found them.” On this excursion, I found an unexpected treasure, and $1.99 plus tax later, a 1970s Butterfly Gold 7 ¾-inch Corelle by CorningWare salad plate left me better than it found me that day. Stephanie is a band director who lives in Athens, TN. She holds both the Bachelor of Music degree in Instrumental Music Education and an M.A. in English: Literary Study from the University of Tennessee in Chattanooga. During the pursuit of the M.A., her research interests were varied, ranging from tracing the ideas presented in the poetry of Walt Whitman to the music of Bruce Springsteen to Arthur Conan Doyle, Sherlock Holmes, and Cocaine Addiction. Stephanie presented a shortened, conference essay, “Self-Administered, Hypodermically, Subcutaneously, or Intravenously: Exploring the Cocaine Addiction of Sherlock Holmes,” at the Tennessee Philological Association Conference in 2010. She currently attends Queens University of Charlotte and is pursuing an M.F.A. in Creative Writing with an emphasis in Creative Nonfiction. When she isn't teaching, or scrambling to meet deadlines, Stephanie is a reader of hard-boiled crime fiction, an avid knitter, and a sometimes trombonist. Read more articles by Stephanie Haun. All original work attributed to Stephanie Haun © 2017 Stephanie Haun.